Writing seems so hard these days. 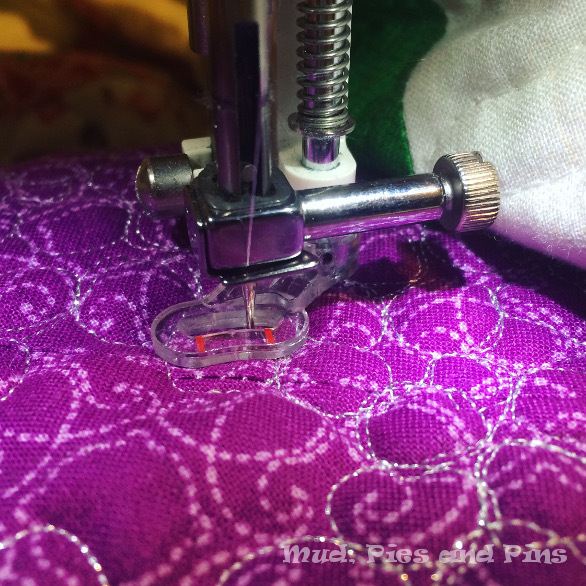 Sewing I can do, but lately when the time comes to write about it it’s another matter. I seem to have lost my writing mojo, and I think part of the problem is that I don’t read as many blogs as I used to. In the past I used my commute time to get online and do some reading but now my train time is all about EPP and, as the colder winter slowly makes an appearance, some knitting too. As a result I don’t seem to read as many blogs as I used and consequently, I think, don’t write as much. As the colder weather arrives, so too do the first snows. 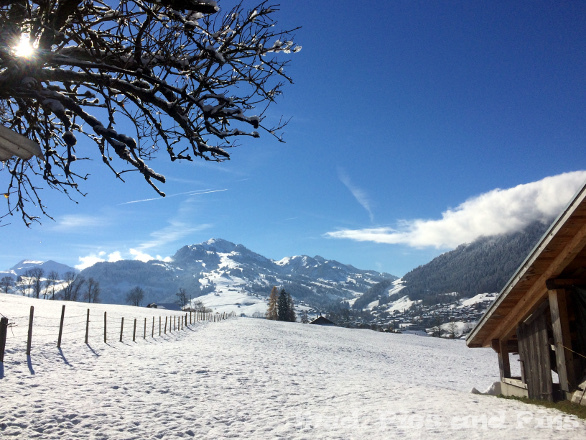 We’ve only had a little dusting at home, much to the boys’ disappointment, but the hills are a different matter. They have seen a little bit more and we hope this is just the start of a good winter to come. Myself and the boys took advantage of a free weekend to escape to the hills over the weekend and I finally got an opportunity to photograph the Poinsettia quilt that I finished a few weeks ago. 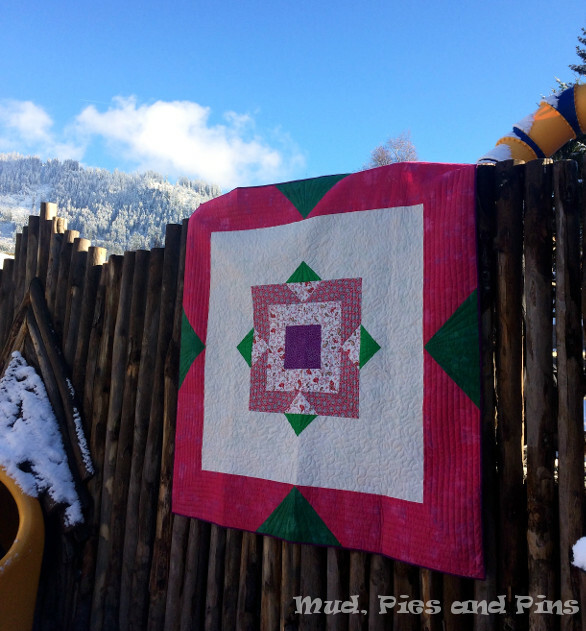 You may remember from my previous post that this quilt was made using the Poinsettia pattern that I had pattern tested for Alyce over at Blossom Heart Quilts and that the main stumbling block to my final finish of it was the quilting of the central square. Well in the end I decided to just keep going with the organic pebbling I had started there, and I was glad that I did. They give the quilt a lovely and sparkly, thanks to the Aurifil Brillo I used, central focal point and I think that it has finished off the floral center perfectly. The quilt was finished during a late night binding session and has sat patiently on the back of the sofa, waiting for me to get it photographed ever since. With its wool batting I knew it was going to be the prefect quilt to bring with on our trip to the hills, when every little bit of extra warmth is much appreciated at night, and so I packed it up along with my camera so I could finally get it photographed. Our initial efforts were none too successful as it was just the wrong time of day to get any photos with the view that I wanted. 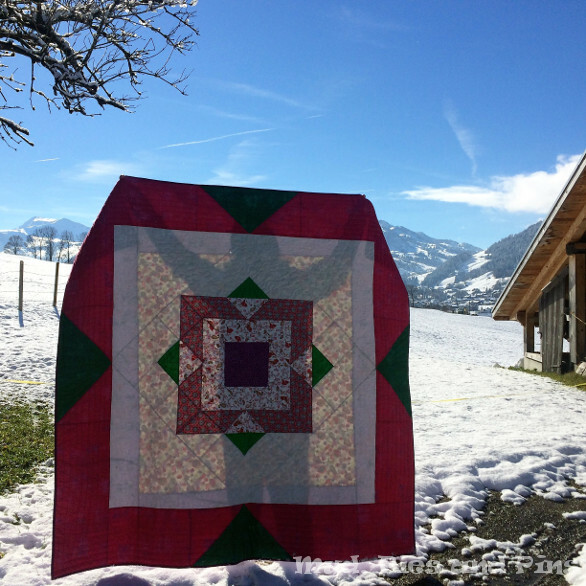 While we did get a few fun pictures, they don’t really show off the quilt in the best light as much of the detail is overshadowed (or should that be under-shadowed?) by the outline of my brother, who very kindly offered to do some quilt holding for me. I then decided to throw the quilt in the car and bring it with us as we headed out any about on our various errands and I was glad I did as in between visits to the local Christmas craft market, the ski rental store and the supermarket we managed to snap a few shots at the playground. So there is in all its glory. 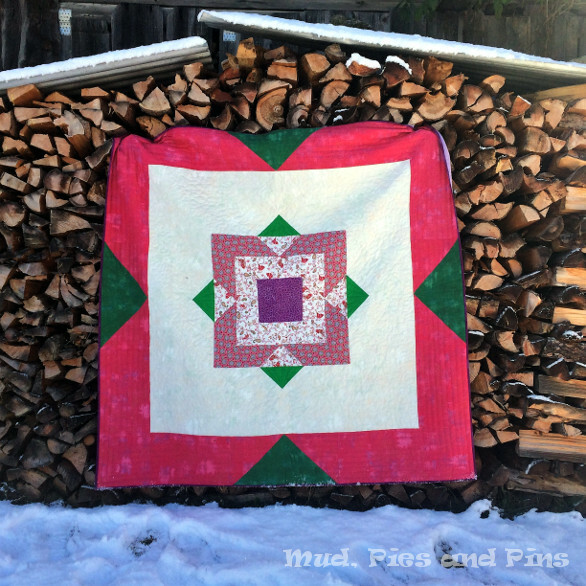 The original pattern by Blossom Heart Quilts was for a 52” square single block quilt. I added 10” borders all round so the quilt has finished up at 72” square, which is just perfect for myself or the boys to use as an extra layer at night. I love the finished quilt and I definitely think that this is a design I will have to revisit again some-time in the future.